Are you opposed to ObamaCare? Willing to attend a town hall to express your disapproval? Odds are good you're a racist. Just ask Cynthia Tucker . . .
As Clay Waters has noted, Paul Krugman alleges that racist motives are at the heart of the town hall protests against ObamaCare. 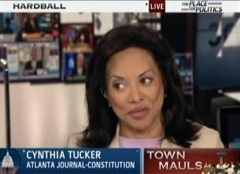 On this evening's Hardball, Cynthia Tucker of the Atlanta Journal-Constitution was willing to get specific, estimating that "45 to 65%" of the protesters are motivated by racism. CHRIS MATTHEWS: Put 100 of these people in a room. Strap them into gurneys. Inject them with sodium pentathol. How many of them would say "I don't like the idea of having a black president"? What percentage? CYNTHIA TUCKER: Oh, I'm just guessing. This is just off the cuff. I think 45 to 65% of the people who appear at these groups are people who will never be comfortable with the idea of a black president.